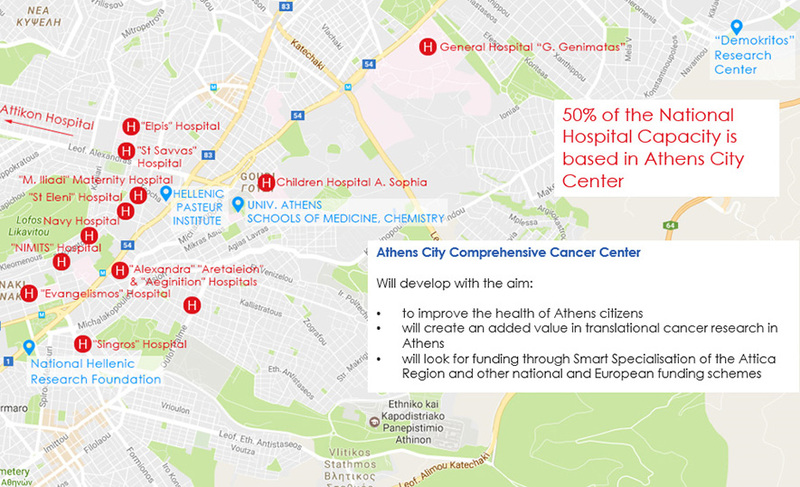 An Integrated Center for Research on Cancer in Athens (ACCC- Athens Comprehensive Cancer Center) has been established involving relevant selected laboratories in research centers and universities and selected clinics in public hospitals. In addition, collaboration with companies from sectors such as pharmaceutical, biotechnology, cancer diagnostics and bioinformatics is taking place. The Athens Comprehensive Cancer Center-ACCC was founded in 2017 and aims to position itself as the first comprehensive cancer center in Greece based on innovative strategies for precision oncology. is to strengthen the interdisciplinary cancer research and especially to improve the lives of patients of this multi-factorial and heterogeneous disease. Researchers in Athens are already developing new diagnostic and prognostic assays, analyzing and utilizing response predictors in personalized treatments and also working towards developing new drugs by chemical synthesis. ACCC aims to contribute to the transfer of knowledge to public hospitals. Today it is estimated that about 50% of the national hospital capacity in beds in hospital-clinics are located in the center of Athens with usually high occupancy rates, therefore direct communication with research centers and specialized university departments is favored.